Mitsubishi Motors Corp and Yamato Transport Co Ltd will start a field test of an electric pickup and delivery vehicle prototyped by Mitsubishi Motors. The prototyped vehicle will be deployed in Yamato Transport's delivery center in Tokyo Oct 15, 2010. And the two companies will evaluate its practicality by collecting data from the vehicle in operation and analyzing it. 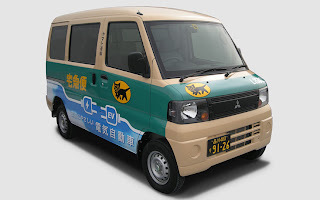 The electric vehicle (EV) to be tested is based on Mitsubishi Motors' "Minicab Van" gasoline-driven commercial light van. The company used the motor and the lithium-ion rechargeable battery of its "i-MiEV" EV for the prototyped EV. Yamato Transport, which is now making efforts to reduce environmental load in its package delivery business, has already introduced 10 units of the i-MiEV. Based on the results of the field test, it will consider employing a commercial electric light van. The company owns about 45,000 vehicles including 4,659 hybrid electric vehicles as of March 2010. Mitsubishi Motors plans to obtain feedback from the field test and aims at an early commercialization of the commercial electric light van. Though the company did not disclose the specifications of the prototyped EV, it is planning to commercialize a rear-wheel-drive vehicle made by equipping the Minicab Van with the i-MiEV's motor and drive trains. If a battery with the same capacity as that of the i-MiEV's battery is used, it will increase the cost of the commercial electric light van. Therefore, Mitsubishi Motors plans to change the capacity of the battery depending on the distance that the vehicle is expected to travel.